Mechanika is an expert stress analysis consultancy, specialising in the application of high level FEA and traditional static and dynamic hand calculations to carry out advanced engineering analysis, engineering design, and full product development. We regard analysis and design as integral entities and we offer design by substantiation services, where equipment and structures are designed to be code compliant and fit for purpose from their inception. We are specialists in core areas which are paramount for all mechanical, structural and product designs. We pride ourselves on our advanced understanding of the core principles of engineering science, mathematics, design and FEA to enable us to guide the design process and help our clients to produce products and technologies that maximize their technical potential and have well documented performance, safety and reliability margins – providing functional and commercial success for our clients. Mechanika is represented by chartered mechanical and structural engineers, operating strictly in accordance with international best practice guidelines of their institutions – Institution of Mechanical Engineers and the Institution of Structural Engineers. We abide by best practice of FEA methods, verification and validation, as stipulated by NAFEMS, in all of our work. 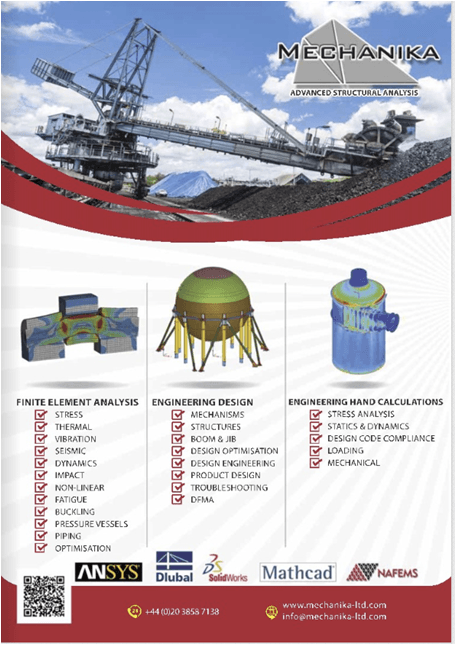 Our design and analysis services are provided on a fixed price basis, with set deliverables from the customer. We cater for small/medium enterprise companies right the way up to global organisations, across all industries – predominantly: Bulk Materials Handling, Aerospace, Oil & Gas, Consumer Products, Medical, Marine and construction. Mechanika works in partnership with Mintronics who are the authorised reseller for all Dlubal FEA software in the UK. We provide training and implementation for Dlubal clients. We deliver technical presentations and workshops on the application and use of Dlubal Finite Element Analysis software, as well as direct training at your premises.